Hospitality-industry authority Amy “Electra Blu” Sherman is an expert at crafting unique, personalized parties and events for every occasion. Sherman has learned to perfect every detail of what takes an event from average to exceptional. 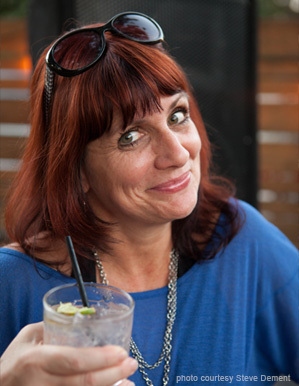 For more than 25 years, she has worked the front lines at some of Austin’s most celebrated and storied saloons, bars, restaurants and hotels, including Waterloo Brewing Company, the Jackalope, the Peacock Lounge and Embassy Suites. From hostess, server, and cocktail server, to bartender, bar manager and catering manager, Sherman has mastered every detail of hospitality. Got an important business event scheduled but don’t know how to coordinate the A/V equipment, diagram the space or make sure the program flows smoothly—and do it all within budget? Never fear! Sherman and her team of expert bartenders, mixologists and event coordinators can tackle the job with aplomb—and make you shine! Sherman’s biggest goal is to personalize an event space, creating a one-of-a-kind atmosphere, and make sure her clients are overwhelmingly pleased with the results. Sherman is well-traveled, and has a great understanding of cultural differences and cuisines, which she brings to every event she caters, bartends, plans, works and hosts. Her degree in fine art and art history, combined with her adeptness with AutoCAD for interior design and her innate eye for what makes a space come to life, is beautifully translated into every event she plans. As an announcer for the Texas Rollergirls and the Women’s Flat Track Derby Association, Sherman is outgoing and accomplished at working a room. She’s even been known to show up in costume for masquerade events, and jump in and get the party started. Sherman has planned frequent luncheons with 400-plus guests, created themed food carts for the Agudas City Limits music event, hosted backyard bridal showers and exquisite annual galas, organized nonprofit events such as the Whammy Awards (the Texas Rollergirls’ annual awards ceremony) and planned entire events for such clients as Impact Austin, the Austin Jewish Film Festival, One Star Foundation and the Jewish Federation of Greater Austin, to name just a few. From composing custom cocktail menus for the most intimate of sophisticated gatherings, to creating themed parties with chic flair and coordinating contemporary large-scale corporate, family, holiday and industry affairs and galas, Amy Sherman brings a touch of sass and seasoned artistry to every celebration.